This is my dear brother Hanif. I loved him and still love him more than anything in the world. Hanif was shot dead in an attack on Camp Ashraf on July 29 and 30, in 2009. I will never forget the last time I saw him. He had been shot in the heart. That day Hanif was embedded in my heart, livelier than ever. I grew up in a family who supported the Iranian resistance against the dictatorship in Iran. Those years, my parents were subjected to various restrictions and difficulties. Many of their friends and relatives were arrested, tortured and executed. Death was the mere prospect for anyone who opposed Khomeini. My family was forced to leave Iran when I was only 3 months old. After a dangerous trip across the border we arrived at Camp Ashraf, where members of the People’s Mojahedin of Iran were based, and my parents were able to join the movement. In 1991, the Gulf war started in Iraq. I remember, we had to sleep in the basement at nights. Every night during bombings, we would be flooded with broken glass. Those were horrifying and hard times. Finally, my mother decided to send me and my younger brother Hanif to another country, and we went to Sweden. So, I started a new life in Sweden. Everything was new. My school, my home, my friends, the language, the culture… I had everything and I had a great life. I could not help but think that many Iranian children at my age were deprived from their very basic needs. Colorful shops full of toys would remind me of the children who would freeze in the cold and die in poverty without ever touching one of those toys. Such images would haunt me every day. Finally, I made a new decision for my life. I decided to change the fate of all those girls, the youth and the children of my country. I packed my bag one day and decided to go back to Ashraf. I told my friends about my decision and left that calm and serene life. I went to Camp Ashraf and later moved to Camp Liberty with all PMOI members. Here, that peaceful and monotonous life is replaced by our struggle for freedom and fight against the daily conspiracies of the enemy to eradicate our movement. I am very pleased that I have chosen this road, because this is the path that my brother Hanif lost his life for. 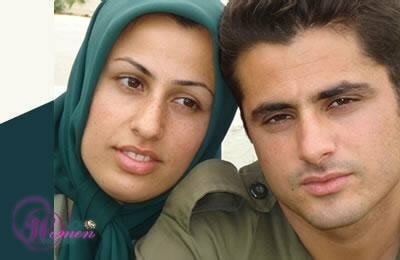 This is the path of freedom that more than 120,000 young men and women, like my brother, have sacrificed their lives for, so that the people in Iran could have a better future. I hear Hanif whispering in my ear all the time, that this is the right path. The one that I chose and the one I am paving with my friends every day. He is with me and is helping me down this road. This is how Hanif’s memory is embedded in my heart.